This web site is parked free, courtesy of hibrid s.a.l. If you are the owner of this website, you can replace this page by uploading your page to the main website folder. Learn about WHOLPHIN this server's breed. 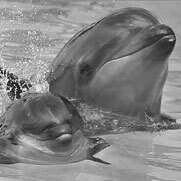 Wholphins are an extremely rare hybrid born from mating a female bottlenose dolphin with a male false killer whale.